Brother International has announced its DCP-9000 Series of Digital Color Laser Copier/Printers. The DCP-9000 Series is designed for small office and small workgroups, and includes DCP-9040CN as a base model and the DCP-9045CDN as an enhanced version. 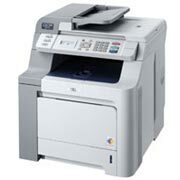 Brother markets the series as copier-printers, they can equally be considered printers with copying and scanning features added. 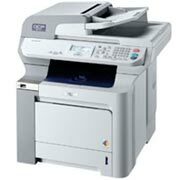 If you view them as multifunction all-in-one printers with printing, copying, and scanning, you won’t be wrong either. General specification of the DCP-9000 Series are the following. Print speeds reach up to 21 pages per minute for both color and monochrome at resolution of up to 2,400 by 600 dpi. Copying speeds are a bit lower — up to 17 copies per minute in both color and monochrome. Copy zoom range varies from 25 percent to 400 percent in 1-percent increments. The two copier/printers have built-in Ethernet network connectivity. They can scan in color at an optical resolution of up to 1,200 by 2,400 dpi. As for the paper input capacity, the devices provide a standard 300-sheet (includes a 50-sheet multi-purpose tray). Besides, the Brother DCP-9040CN includes a 35-page automatic document feeder, a two-line LCD display, and 64MB standard memory. features a five-line LCD display; 128MB memory standard. Information for the environment conscious: unlike the base model, the DCP-9045CDN is Energy Star certified. Both DCP-9040CN and DCP-9045CDN support standard or high-yield replacement toners to choose from. Standard-yield black toner cartridge yields of 2,500 pages, while high-yield black cartridge has a yield of 5,000. Three standard color toner cartridges will be available with yields of 1,500 pages, and high-yield versions would yield 4,000 pages.The DCP-9040CN is available this month for estimated price of $600, and DCP-9045CDN will be available in December for approximately $700. This entry was posted on Thursday, November 29th, 2007 at 7:31 am	and is filed under Brother, multifunction, printer. "Print Your Photos From… TV"
"Star of Samsung And Afterlife of Toner Cartridge"